1) Children’s “legalisation” depends on the “legality” of their parents. As has been repeatedly stressed, no sans papiers can benefit from the proposed naturalization process. 3) Proposed army recruitment of immigrants (a relief for the army ranks in view of the growing reluctance among Greek youth to draft) adds to the exploitative blackmail that makes legal residence dependent on work revenue stamps (immigrant active workforce’s contributions with no pension claims so far have been so far the Greek administrations preferred approach for dealing with the ailing public insurance funds); the unacceptably high fee (1,000 euros per person which means millions of euros for the state ) is maintained. 4) The much debated bill is merely an integration regulation for immigrants mostly from Albania, after two decades of overexploitation and in exchange for votes. On April 28, 2009 Albania formally applied for EU membership. This prospect might seem remote, but wasn’t it the same with Romania and Bulgaria some years ago? Thus, although it now seems that the naturalization process applies and is of interest for the majority of immigrants in Greece, in a few years, when the Albanians will be EU citizens, the now proposed regulation will only aplly to a very small minotirty of immigrants. In fact, those in the worst position now will be then further devalued. The division into ‘goods’ and ‘bads’, ‘useful’ and ‘superfluous’, ‘legal’ and ‘clandestine’ immigrants is being petrified as the global system of exploitation deepens. Alongside with the proposal of the “benefactory” bill the Greek state has been all the more stressing its commitment to “zero tolerance” policies, the “sealing” of the borders, deportation camps, the Pact on Immigration and Asylum, the Dublin II Regulation, the Schengen Treaty, the Outrageous Directive. Finally, we should remind that the law provision for deporting immigrants charged (not convicted) of minor misdeeds on “public order and security” grounds is still in effect. On November 11, 2009, PRO ASYL, along with fellow refugee organizations Dutch Council for Refugees, Finnish Refugee Advice Center, and British Refugee and Migrant Justice, filed a complaint with the European Commission against Greece. Twenty other European refugee organizations support the complaint. PRO ASYL demands that the European Commission immediately initiates an infringement procedure in the European Court of Justice based on Greece’s failure to abide by fundamental European asylum policy. Greece provides for asylum protection within its laws, however it falls short of its legal obligations in practice. COMPLAINT & REPORT available at NGO complaint against Greece. The report includes many testimonies. The purpose of demonstrators was to ask the Greek government to clarify what the future holds for illegal immigrants in Greece. What problems are the Somalis experiencing in Greece? The life- issue of Somali immigrants in Greece is really ineffable and seems strange. There is no any one who felt an obligation to write and verbalize about dire complaints and hardships of the immigrants, especially Somalis in Greece. Most of Somalis in home, Africa and Asia are obsessed about going to Europe by any means, believing that poverty, ignorance, lack of healthcare, poor education, unemployment and uncertainty of the future are the only signs in the life outside Europe. To avoid those horrendous and aching scenarios in Africa and Asia, most of Somalis choose more than other immigrants in the world to wildly embark upon death – life journeys to get to – as they believe – the most comfortable and prosperous countries in Europe, Scandinavian nations or Great Britain in particular in search of unfailing future together with what the best life in those countries can offer to everyone. Although there are many travel routes in which Somalis exert, all of them don’t succeed in accomplishing the painful travels they face so some all the time take a risk and lose their lives on their way to their desiring destinations after they drown in either Mediterranean sea or red sea. A great number of Somali prisoners who are immigrants – because their country already turned to a ghost land – are in the jails of the countries like Libya, Tanzania Zambia, Malawi, Mozambique and others. Some Somali immigrants successfully completed their adventurous trips to Europe but some got trapped in Greece where in recent times became only route for Somalis illegally departing to Europe. There their dreams of life changing came to an end in despair. These people have encountered a lot of hardships in the life and lacked any way to get out of Greek country while their families who arranged the travels financially and morally for them anxiously wait to find any kind of life – support from them. Greek government authorities regularly address about the situation in order to find a lasting solution to the plight of Somali immigrants. The officers put strong recommendations forward to Somalis living in the country to take Greek permanent immigrants documents and the government would handle the needs of Somalis or to enroll themselves in UNHCR offices in the country and that is not lovable for them. These substantial advices from Greece went to deaf ears because Somali migrants who are so far on move of passing though Greece to Scandinavia or UK are extremely scared to be ever stuck in Greece because of their fingerprints taken by the police. Somali Greek Diaspora activist, Mr. Ilyaas Ali, called at some of Greek detention centers in Athens like Elidabon,Kiria and another prison in the vicinity of Athens airport where the detainees are mostly Somalis to assess the conditions and make out the arrested number of Somalis. This evaluation visit seems to the suffering Somalis in Greece the start of release of hundreds of Somalis in jails and the route to better life in the near future. seekers to Greece under the Dublin II Regulation. Report by the Norwegian Helsinki Committee (NHC), the Norwegian Organisation for Asylum Seekers (NOAS) and Aitima. Based on evidence gathered during investigations in Greece, Turkey and Iraq between April and September 2009, and corroborated by reports and fi ndings of international human rights monitoring bodies and NGOs, we argue that the principle of non-refoulement is severely threatened by the Greek practice of illegal deportations, and consequently by transfers of asylum seekers to Greece under the Dublin II Regulation. In this report we present specifi c instances of illegal deportations by the Greek authorities of persons with pending asylum cases, as well as of other groups. Such deportations take place in such an arbitrary manner that there is no basis for claiming that Dublin returnees enjoy a higher degree of protection than others. On a hill above the town of Samos in eastern Greece are a series of long buildings with grey walls and red roofs. They could be a barracks but this is a detention centre for immigrants. It was built to hold 300 people. Today, 473 are held there. Fifty-three are women and 10 are under the age of 18. They live behind barbed wire and wait. They stay for between one and three months, their frustration gnawing away at them. These are people who have made long, often dangerous journeys to reach the shores of Europe. A few claim asylum but that is no longer a popular option. It can tie up a migrant for months. In Greece only 0.1% of asylum seekers are successful compared to 76% in Finland. The common story is that after a month or so they are transferred to a detention centre elsewhere in Greece. They are eventually freed and told they must leave the country within a month. The vast majority head west to other European destinations. The UK remains the favourite country. In London they can find their own community which will provide them with work often in the underground economy. It is an abiding belief that the British will eventually allow them to stay. There is another factor that drives them west: Money. Those from Afghanistan are often in the hands of powerful and dangerous traffickers. Some in the camp here in Samos say that it costs the equivalent of £16,000 to get from Afghanistan to Britain. Often their families back home have sold houses to pay the people smugglers. Some will have to pay the networks from whatever they earn in London or other European cities. Without work they and their families are at risk from the traffickers. They owe a debt and will not be deterred by officials or laws. One lawyer looked at this camp and said there could be £4m of business right there. The Greeks know that they are, in effect, just passing on the problem but, in their view, they are overwhelmed. They want the rest of Europe to start taking a share of those who arrive on Greek shores. That is unlikely to happen soon. It is difficult for any country to take a quota of immigrants determined by others. In any event some fear that a quota system would only encourage others to head to Europe. 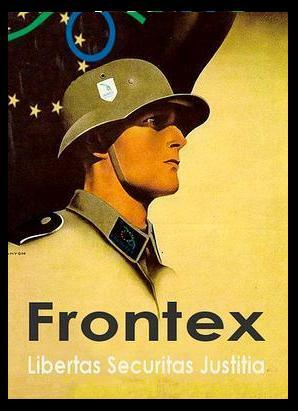 intention is to beef up border patrols by giving more money to Frontex, the relatively new body that operates planes and ships. Certainly here in Greece there is little evidence that Frontex patrols have a deterrent effect. The traffickers tell the migrants that if a Frontex boat appears to jump in the water and they’ll have to rescue you. Measures are being considered to make it harder to grant mass amnesties for illegal migrants but that leaves open the question of what should be done with them. The EU is also working on what it calls a “Return Directive”. It is expected to become law by December 2010 and is supposed to make it easier to send home illegal immigrants but the law only applies once a decision has been taken to deport an immigrant. The UK has opted out of this. If it is intended to deter migrants it is unlikely to be successful. Detainees will have the right to appeal against deportation, to see legal advisers, family members and get medical attention. It is a directive that will provide a lot of work for lawyers. It is the view of the UK that it could make returning illegal immigrants more difficult because detainees will have more power to challenge deportation. When economies were growing fast and there were gaps in the labour markets some countries were relatively relaxed about these arrivals but with 22 million people out of work across the EU the mood is changing. There were 238,000 asylum applications last year and just over a third were approved. As to the number of illegal immigrants no one knows. There may be a decline in those trying to get to Malta or Italy from Africa. This is partly because of an agreement with Libya to restrict the crossings. But the numbers have edged up in Greece and Southern Spain. The reality is that in the midst of a severe recession the migrants have not been deterred. Many fear for their lives if they return home owning money. Currently there is no common European approach to this problem. There are moves and initiatives but, for the time being, Europe is like a trip wire. It makes live difficult for the migrants but it does not seriously put them off coming and neither does it help them settle. YOU CAN SIGN THE PETITION THERE! 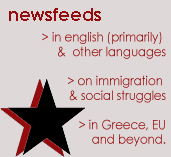 Stop deportations to Greece – suspend Dublin II! Please read, spread and sign this Communiqué from activists of the international No Border Camp 2009 on Lesvos concerning the Dublin II regulations and deportations to Greece. You can sign using the form below (introduced due to popular demand). Let’s build pressure! As activists of the international No Border Camp 2009 on Lesvos, we are witnessing a policy of systematic human rights abuse against migrants and refugees. As a crucial symbol for this policy stands Pagani, a detention centre, situated in the outskirts of the city of Mitilini, for migrtants and refugees, women, men, minors and children, who arrive in Greece without documents. People are imprisoned in Pagani for many weeks, even months. They are forced to share a room with approximately 100 people. About 1000 people are constantly locked up in a place normally designed for only 280 people. Sanitary and medical conditions are beyond any possible imagination. It is not even necessary to describe the further consequences of forcing people to under these circumstances, since the absolute lack of human rights is all too obvious. During the week of the No Border Camp, partly as a result of the political pressure created by solidarity actions and media reports scandalising the terrible situation, one part of those detained in Pagani have been released and a temporary open camp set up next to the airport of Mitilini. International pressure is vitally important now to force the Greek state to release all the Prisoners at Pagani, to close down the detention centre and to provide a permanent solution where refugees and migrants can stay as free persons when they arrive in Greece. Furthermore, the problem doesn’t end there. Even if they are released from the horrors of Pagani, the futures of the Migrants passing through Lesvos are often bleak. The reason is: The Greek state strictly excludes the great majority of refugees to get asylum or a regular stay. For those who claim asylum, the rate of success in asylum procedures is almost zero. Most refugees don’t receive any support for housing and daily survival. Released from detention in Lesvos, the refugees receive nothing but a ticket for the next ferry to Athens and a white paper telling them that they have 30 days to leave Greece. After this time, many of the refugees end up in Athens, Patras or other Greek cities, as undocumented and homeless people, living in unbearable conditions in slum camps or in public parks, always in danger to be arrested and detained again by the Greek police. The white paper doesn’t offer any possibility to travel further to other European Union countries. Having no chance to find living conditions in human dignity in Greece, the refugees are also excluded from claiming asylum or settling down in other European Union countries under the “Dublin II” convention. The determining factor is that they are very often digitally fingerprinted after the first contact with the Greek authorities. As these fingerprints are stored in the Europe wide “EURODAC”-database, the authorities in any other European Union country will immediately find out if a person who claims asylum has been in Greece before. Who the Greek authorities chose to fingerprint and who they do not is completely arbitrary, it is a kind of human rights lottery. Under “Dublin”-rules, migrants must be returned to the so-called “safe first country” of the European Union, which means that people whose fingerprints have already been taken in Greece will be deported to there. The “Dublin”-rules mean that the borders are truly carried everywhere with the migrants, haunting him or her at every turn. This means for the migrants that their fingers, their own bodies, become their enemies. As the most extreme consequence of this situation, some migrants in Calais, who make their last attempt to get to Britain after having been chased away from all other EU-countries, go as far as to attempt to burn off their fingerprints with hot knives or acid so as not to be identified. Similar examples of self mutilation have also been reported from the Netherlands. So we can see that the “Dublin” system is built to exclude migrants and refugees from Europe, starting in Greece with its zero tolerance asylum policy. “Dublin”-rules are built so that the migrants’ rights and their possibilities of living a decent life are destroyed and they are left to the mercy of unscrupulous employers who exploit the situation of undocumented people. Greece has the role of watchdog for the European Union, “Dublin II” serves the racist agendas of the more powerful states of the European Union who, while claiming to respect asylum rights, never cease to fund externalisation projects to prevent refugees from entering their territory. In this sense, the European Commission provided funds for the Greek system of handling asylum and migration control. While there is criticism from human rights organisations like Amnesty International and even the UNHCR has criticised the inhumane treatment of asylum seekers in Greece after considering how the Greek government, instead of improving its asylum system, dismantled it, the European Commission has remained silent. The Commission, in fact, also accepts that a lot of money has been syphoned off by the Greek state. 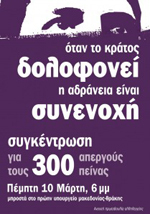 Crucially, the Greek state is paid 4000 Euro for each person returned through the Dublin II agreement. This means that the European Union is in effect sponsoring a policy of the total refusal of asylum and daily human rights abuses, with Greece playing a core role in implementing the conditions of the “Dublin II” – convention. Moreover, a core part of EU migration control policy is blackmail: In return for possible accession to the European Union, Turkey is obliged, under the “6 point plan” which it has signed with Greece, to accept readmission agreements. Thus, “refoulement”, the systematic return of people without being given the opportunity to claim asylum, even if their lives and human rights are put in danger, has become the official mechanism for the deportation of refugees. As activists of the No Border Camp 2009, the aim we are struggling for is global free movement for every person living on this planet and the end of any form of migration control. Shut down Pagani and all detention centres in Greece! We don’t accept little improvements and modernisations of legal standards as a legitimation to continue the externalisation of border controls and deportations based on the “Dublin”-convention. We want an end to all forms of repressive border regime! 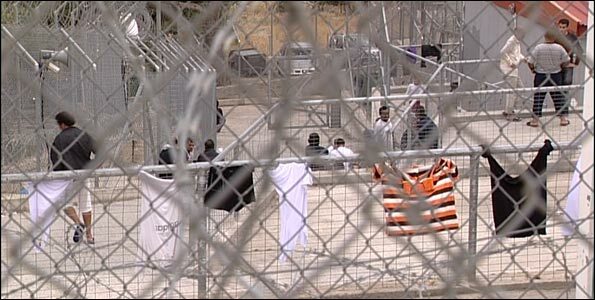 700 prisoners in Pagani, around 150 women and children and 150 unaccompanied minors. The minors living on the first floor set fire to matrasses in their cell, which produced a lot of smoke. To escape from the smoke they broke the bars of the window and went on the very small balcony in front of their cell window. They screamed for their freedom, some were very upset and the situation was very dangerous. The policemen of the prison managed to extinguish the fire. More policemen, fire brigades, journalists and observer in solidarity arrived. The tension spread to the other cells. The prisoners broke the door with the iron bars and went out into the yard. They were absolutely peaceful and the police didn’t react. Around 400 prisoners were in the yard. The negotiations between the prisoners and the police and the prefect lasted until late in the night. Pikpa open camp at the airport would be reopened, and families arriving on Lesvos would be sent there straightaway, without detention. That was the last word we heard over last weekend. On Monday, nothing had happened yet, but it was somehow blamed on a strike going on in the port of Piraeus, stopping all ferry traffic and thus impeding the transfer of migrants from Lesvos to Athens. But it already sounded like a bad excuse. So finally yesterday, we learnt that all three promises were nothing but blatant lies. Pikpa open camp has not been reopened, no minors or families were released and the only change is that by now, about 20 riot police of the notorious MAT are stationed at Pagani prison in order to suppress any new ensueing revolt. Y’all know that that means: we have to continue our campaign on Pagani prison and detention in general, and we hear that first actions all over Europe are already in preparation. So for one stay tuned, and for the other: Can you think about organising a local action where you live? We will be providing a set of material to support such actions, like we already started providing our videos. On the other hand, there are good news, too. Other friendly observers from Lesvos report that the attitude of the population towards refugees and migrants is turning, and that numerous acts of practical solidarity with refugees can be observed. Even the site of the noborder info-point in Mytilini still seems to function as a meeting point for refugees, migrants and people interested to get in touch with them. Noborder left behind a new social space. Meanwhile in Germany, concrete effects of the scandalisation of the detention conditions of refugees in Greece can be observed. The german constitutional court, i.e. the highest court in Germany, made an express decision stopping an Iraqi refugee from being deported to Greece under Dublin-II. At first the newspapers reported that it was a rather formal decision, they said he needed to remain in Germany since in Greece, he would be homeless and thus, the court would not be able to serve correspondence to his postal address. However, in a press release some days later, the court was tentatively questioning the legality of the whole Dublin-II regime, announcing that it would evaluate it and audit whether it was compatible with the german constitution. This is the first time since 1996 that the constitutional court is thorougly auditing a main pillar of the german asylum system. As a first reaction, refugees imprisoned at one airport after having been arrested coming from Greece have been freed, and the local authorities stopped the imprisonment of all further refugees coming from Greece. It is expected that the lower courts will follow the ruling of the constitutional court. So: deportations to Greece under Dublin-II seem difficult (the authorities still try to do it, and they manage if there is no legal fighting back), but there are first ideas about a serious campaign against Dublin-II. Again: stay tuned, and join the resistance. Another serious development is that the German interior minister made a complete u-turn in his talking about the Greece asylum system. Before, it was always stated that Greece had a propoer asylum system, and that refugees sent back to Greece would live under proper conditions. Clearly, after all the media attention the issue attracted over the summer, such a lie could not be upheld. So at the EU interior ministers’ meeting in Brussels on the 21.9.09, a statement was issued by the german interior minister denouncing the living conditions of refugees in Greece, stating that human rights standards had to be adhered to all over Europe and implying that Greece was in fact threatening the whole Dublin-II regime. We concurr insofar as that we also believe that Dublin-II is ripe to fall, but we believe that putting the blame on Greece alone is wrong: Germany is profiting very much from Dublin-II, in fact the whole german asylum system rests on Dublin-II, and it is a European issue, not just a Greek one. Calais is turning into a hell with all the jungles being destroyed – the Hazara and Iranian jungles were destroyed, this moring the Eritrean squat was evicted and a fence put around it; security with dogs are preventing people to retrurn and collect their few belongings! As a result some migrants have initiated a hunger strike and they need support. There are some people coming to Calais on Friday [last week] from London and from the Netherlands: if you need a lift from London there is possibility of a minibus, call the communication phone 0033 6348 10710, or to take stuff from London to Calais. You can always follow the development at their blog calais migrant solidarity, and there is a call for a direct solidarity action on the 28th and 29th of November. As of 12am French time today a group of migrants in Calais started a highly visible hunger strike in a public place. The migrants, from regions including Iran, Afghanistan, Sudan, Palestine, and Egypt, say they will continue the strike until Western countries co-operate to offer them asylum. They are also demanding that no migrant in Calais is readmitted to Greece, Italy or Malta. The migrants face constant harassment from police. Every day some amongst their number are arrested, taken to the police station only to be released in four to six hours. Occasionally they are held for as long as two days. Repression intensified recently with the destruction of the jungle where many migrants lived, the trigger-happy use of tear gas including on pregnant women, destruction of personal belongings and the targeting of migrants observing fasting during Ramadan by arresting them at nightfall and throwing away their food. If the police try to separate the hunger strikers or arrest them on spurious grounds, they say they will continue the hunger strike while under arrest and move again to a public space to continue the action when freed. No Borders activists are already supporting the hunger strikers by standing alongside them, but the migrants are calling for support from all over the world. Messages of support can be left at http://calaishungerstrike.wordpress.com and the hunger strikers welcome anyone who wants to join the hunger strike in solidarity whether in Calais or elsewhere. With migrants facing increasing repression and winter approaching, the situation is urgent. But they say Western countries should not abrogate their responsibilities by readmitting migrants to the first European country they were fingerprinted in. Many migrants who are readmitted to Italy, Greece and Malta say the situation is much worse there than living clandestinely in Calais and that they are oppressed there. In Greece, readmitted migrants are often locked up for three months and increasingly for six months. On release, migrants still have nowhere to go and continue to be targeted by police who beat them and sometimes rip up their papers. Readmission is not the solution according to the hunger strikers – countries including the UK, Canada, USA and Sweden should take a proportion of the hunger strikers. For further information, or to arrange an interview with one of the hunger strikers, call 0033634810710. The UN Refugee Agency repeated its criticism towards Greece for holding 140 young migrants at a detention camp on a Greek island on Tuesday. The UNHCR said the unaccompanied minors, mainly Afghans, should not have been detained at the Pagani centre on the island of Lesbos in the Aegean Sea. Ketty Kehayoglou, UNHCR Greece, said the UNHCR would “alert Greek authorities to the fate of these minors, who should not be detained but who have not been offered any sort of structured reception“. The UN Refugee Agency has previously urged Greece, a major entry point into Europe for migrants, to stop placing children and asylum seekers in detention camps. Gilles van Moortel, spokesperson for UNHCR in Brussels, says the other EU Member States should not return refugees to Greece under the Dublin regulation. “As long as Greece does not guarantee the legal rights of the individual and as long as other European countries despite that are returning asylum-seekers to Greece, this rotation will continue. The Dublin-system does not work”, he explained. Earlier this summer UNHCR pulled out of its cooperation with Greece and has recommended that countries make exceptions to the Dublin regulation, refraining from returning asylum-seekers to Greece. (Paris) – Many of the hundreds of migrants arrested by French authorities following the destruction of their makeshift camp in Calais are at risk of being sent back to Greece, Human Rights Watch said today. The French police reportedly arrested 276 migrants, including 125 children, on September 22, 2009, and destroyed their makeshift camp. The French immigration minister said several months ago that many asylum seekers entered through Greece and should be returned there. The New York Times, reporting on the situation, cited remarks by French officials that those who had entered the European Union through Greece would be returned there. The UK’s home secretary is quoted in The Guardian expressing his “delight” at the Calais operation and saying that the migrants there could seek asylum in the first country they entered, meaning that many are likely to be returned to Greece. Human Rights Watch said that France and the UK should ensure that any children among those removed who have family members in the UK, including siblings and other close relatives, are able to join them on humanitarian grounds. Under the European Union’s Dublin II regulations, the country where a person first entered the EU is generally held responsible for examining that person’s asylum claim, whether or not the person applied there. European governments enter the fingerprints of all migrants they apprehend into an EU-wide database that allows other governments to trace where a person first entered the EU and to send that person back. While the Dublin II regulations are premised on the notion that all EU member states have comparable asylum and migration practices, there are wide disparities, with some countries like Greece effectively offering no protection at all. This disparity underscores the importance of reforming the Dublin system and ensuring that EU member states are held to account for their failure to respect their obligations under EU law to provide access to asylum. Human Rights Watch has called on European governments, in two reports released in 2008, to stop sending migrants and asylum seekers, including unaccompanied children, back to Greece under the Dublin II regulations. The reports said that Greece fails to guarantee a fair assessment of asylum claims, continues to detain migrants and asylum seekers in conditions that can be inhuman and degrading, and has not provided adequate reception conditions for migrants, or special protection for vulnerable groups, such as unaccompanied migrant children. Greece also adopted a law in July abolishing ameaningful appeals procedure. The new law leaves asylum seekers with no right to an appeal or remedy against risk of removal to inhuman or degrading treatment, as required by article 39 of the EU’s procedures directive and articles 13 and 3 of the European Convention on Human Rights. Asylum seekers whose claim has been rejected are at risk of being immediately deported. Concerns are further heightened, Human Rights Watch said, due to Greece’s recent arrests of large numbers of asylum seekers and their transfer to detention centers in the north, close to the Turkish border, where some are reported to have been pushed across the border back to Turkey. Greece has a record of systematically pushing migrants back to Turkey, including those seeking protection. On August 5, Human Rights Watch wrote to the Greek interior minister asking him to take immediate steps to stop this practice and to treat migrants apprehended in Greek territory in a humane and dignified manner. In a November 2008 report, “Stuck in a Revolving Door: Iraqis and Other Asylum Seekers and Migrants at the Greece/Turkey Entrance to the European Union,” Human Rights Watch documented how Greek authorities have systematically expelled migrants illegally across the Greece-Turkey border, in violation of international law. These “pushbacks” typically occur at night from the northern detention facilities, and they involve considerable logistical preparation. At that time, Human Rights Watch conducted private, confidential interviews in various locations in both Greece and Turkey with 41 asylum seekers and refugees, who gave consistent accounts of Greek authorities taking them to the Evros river at night and then forcing them across. France and other EU member states are bound under the European Convention on Human Rights not to return a person to a country where he or she is at risk of inhuman and degrading treatment (Article 3) and bound by the international legal principle of nonrefoulement. The Dublin Convention allows parties to exercise their discretion under article 3 (2) (the sovereignty clause) not to return an asylum seeker and to examine the asylum claim themselves.